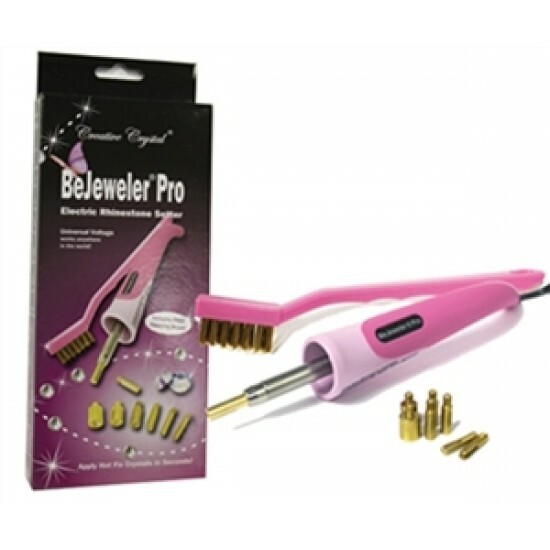 The original hot fix applicator invented by Swarovski for hot fix rhinestones - beyond question the best hot-fix tool on earth! universal voltage and will work in any country without a voltage regulator. Shortest nozzle possible provides the ultimate precision placement. 110 / 220 Universal voltage for use with any voltage in the world. Free cleaning brush to keep tool in perfect working condition for years. Rhinestone tips in 2mm, 2.5mm, 3mm, 4mm, 5mm, 6mm, 7mm sizes that are etched for easy size identification. Hot Spot (flat) tip for applying all other size / shape hot-fix embellishments. Support stand, insert with detailed directions and patterns. UL, CUL and CE certified. Flared end on handle helps prevent fingers from touching heated metal. This is genuine Swarovski Crystal, which is manufactured in Austria. The size is SS 20 (~5mm) and the colour is Blue Zircon (229). Swarovski crysta..